Those who enrol in Arts One are able to use the beautiful and spacious IBLC 380 Gateway space, a quiet study area for use by current First-Year Gateway Students only. Gateway is the term used to refer to the four First-Year programs that share this space: Arts One, Science One, Coordinated Arts Program (CAP), Co-ordinated Science Program (CSP). This quiet study area has floor-to-ceiling windows along with a section of study carrels. Ike’s Cafe is right downstairs on the second floor, and many Arts One classrooms are downstairs on the first floor of IBLC. You will require a valid Gateway Student sticker on your UBC Student Card to use the Gateway Quiet Study area as it is reserved only for first-year Gateway Students. 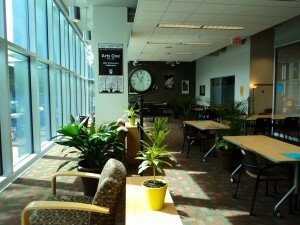 The Gateway study area is where you’ll find the Arts One main office and your Arts One professors’ offices. The Gateway Suite is in the south wing of the Irving K. Barber Learning Centre (1961 East Mall), Rm 380. This is part of a modern addition to the historic Main Library; the original 1925 building remains at the core of the Learning Centre. IBLC is a very popular study area on campus and Gateway students are fortunate to have a dedicated home base in this busy building.